Here is a collection of tools in context of FLUKA input and output. This space is open for similar software tools - please feel free to contact the FLUKA team to suggest and/or participate in additional projects to develop tools. User input/feedback is very much encouraged. 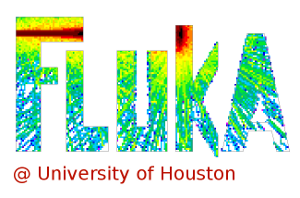 An advanced user interface for FLUKA to facilitate the editing of input files, building the executable, execution of the code, visualization of the output files, merging of the data files and generation of high quality graphs using gnuplot as well as photorealistic 3D plots of the geometry with data superimposed with PovRay. A cross platform application based entirely on python and Tkinter. The installation instructions for FLUKA in a Docker container in Mac and Windows 10 can be found here. The installation instructions for FLUKA in the Windows Subsystem for Linux (WSL) here. This is an experimental new way for running FLUKA in Windows 10. Development of a FLUKA interface to the GEANT4 geometry format. A subset of GEANT4 volume definitions has been implemented. In this mode, FLUKA utilizes the GEANT4 geometry package internally in order to determine where a particle is in space, ie. in which volume. SimpleGeo is a new project to provide a graphical tool in order to compose/manipulate FLUKA geometry input (including the material aspect) and perform 3D visualization. TVF NMCRC is user interface for writing and executing FLUKA input files under development. TVF (Testing & verification for FLUKA) - features a graphical interface for easy working in the FLUKA environment. It can be of help especially for new users in order to build the FLUKA input fies. By using it, you do not need to check how to write, how many "WHAT" you have to use, how many spaces you keep, what are the physical constants and other related questions. Authors: Sergei Homchenko, Maxim Shifrin and Dr. Shlomo Mark from NMCRC (Negev Monte Carlo Research Center, Israel). These programs provide an interface between FLUKA and AutoCAD, permitting to visualize FLUKA geometries (FLUKACAD) and simulated particle tracks (PIPSICAD) in three dimensions in AutoCAD. FLUKA backend Graphical User Interface to inspect/manipulate standard FLUKA output files. The project is developed within the root framework. Currently only USRBIN output is supported. In addition the implemented geometry can be visualized in a user friendly way following the traditional FLUKA concept of 2D cut planes. Syntax highlighting scripts for the editors: Emacs and Gvim. Obsolete software. No longer supported. A collection of BRexx scripts to facilitate editing of fluka input files as plotting the geometry and USRBIN results. The scripts are able to convert the fluka files to various formats like: MCNP(X), Povray, DXF, and between all possible formats that fluka acceptsfixed, double precision, free format, with names or numbers. Note: These utilities are substituted by the Flair project.